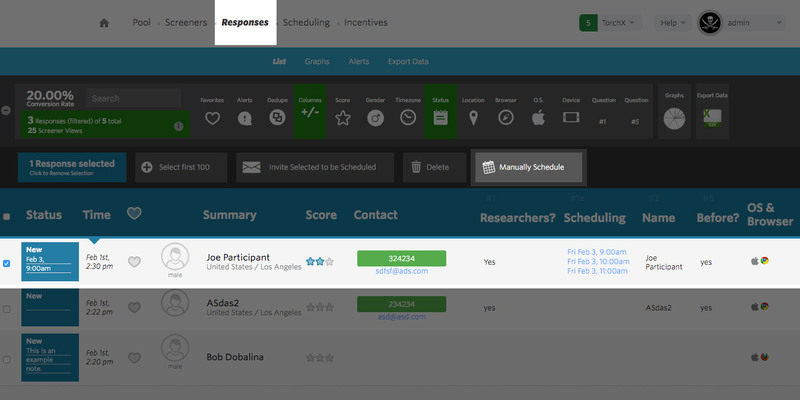 Let's say you have an existing response in ethnio, and you're using a screener with a scheduling question, but the respondent didn't pick the right time, or you've been communicating directly with them via email or text and you want to move them over to a new time, but you don't want to ask them to fill out a screener again. You can do that from Responses >> Check that left-side checkbox next to their name >> Manually Schedule. This will allow you to assign them to a new time, and then from there you can choose if you want them to receive a new invite email or not, and if you manually confirm them for that new spot, they can also receive a new details email. C'est tout. This then takes you to a page where you fill in times for them, but it doesn't trigger an email to them at all.